Welcome to our comprehensive buying guide to help you find the best garage heater for your garage, warehouse, workshop, art studio, barn and just about any enclosed space that you need to keep warm during those cold months. We’re truly packed a lot of information into this article so we hope you find it useful. The first half of the article lays the groundwork and is meant to be educational while the second half of the article focuses on reviews of specific garage heater models. Garage heaters are one of the most effective, as well as cost-efficient means to make your garage/ basement more usable during the winter. They are affordable (compared to central heating), easy to operate, and reliable. Most of them are equipped with ergonomic handles and/ or wheels for mobility. Typically speaking, garage heaters are portable, although extra-powerful stationary models are also available for people who are fortunate enough to own larger garages. While the main purpose of a garage heater is to make your garage more convenient to use during the winter, it can also be used to heat the basement or other small rooms. By principle, the garage heater is essentially a type of space heater- a means to warm the air inside an enclosed space (in this case, your garage). All you folks who own a garage, must have figured out by now that it does more than just shelter your vehicle from snow and dust. Garages can be used for car and equipment repairs, or for storing things like garden vegetables, cans of paint, gasoline, and pretty much anything else that your spouse might not want inside the house. Many people who are into hobbies such as carpentry, metalwork, or painting tend to setup workshops inside their garages or basements. Since you clearly don’t wish to work in the freezing cold, you might as well invest in a nice little garage heater for your shop. Garage heaters can also help keep the ambient temperature warm enough so that the oil inside your car engine doesn’t freeze. In this article, we are going to walk you through the process of selecting and buying the perfect garage heater for yourself. After we discuss the benefits of owning a garage heater, we shall advance into explaining the working principles behind an average garage heater. Once you have understood how these machines function, it will be much easier for you to grasp the concepts behind distinct types of garage heaters, as well as the pros and cons to each design. Finally, we will review 9 of the finest garage heaters that are available for purchase on the market right now. We hope this article gives you a good understanding of how garage heaters function, as well as the distinct types of garage heaters out there so that you can make purchase decisions based on your own specific needs. Without further ado, let’s get to it. Save on Insulation and Central Heating Costs: Garages can be of two types – attached, or detached. Attached garages are integrated into the rest of the house, meaning that it shares one or more walls with the rest of the house and you can directly access the house from the garage. Detached garages are free-standing structures which are completely separate from the rest of your house. If you have ever experienced the interiors of either type of garage during chilly weather, you can confirm that it is much colder inside a detached garage as opposed to an integrated (attached) garage. The reason is that, when you integrate a garage structure into the house, it shares walls with the adjacent rooms of your house. This helps increase overall insulation and surface area, meaning that heat is not lost as quickly as it would if the garage was open on all sides (like in the case of a detached or separate garage). One more thing- having an integrated garage gives you the option of insulating the shared walls as well as doors, and you can also install heat ducts to connect the central heating system of your home with the garage. But since you don’t really use the garage as much as you use the rest of the house, installing heat ducts and insulating barriers can be a waste of resources and time. Instead, what you can do is buy a garage heater for a fraction of the cost that is required to integrate the central heating system into your garage. Granted, the heating will not be as evenly distributed since a garage heater tends to heat up some areas more than the others, but you can still position the machine so that it heats up the space near your car or wherever you have your workshop setup inside the garage. Besides, we assume that your central heating system runs on electricity anyways. A garage heater that runs on gas will be far more cost efficient than installing heating ducts and insulation material in your garage. If you own a detached garage, then owning a nice garage heater is an absolute must. The insides of a separate garage are much colder during winter (compared to attached garages), and you definitely need a heater in there to ensure that your car engine doesn’t freeze after you leave it inside for a night. Besides, if you own any kind of workshop or use the garage as a storage area (for paints, oils, plants, etc. ), then keeping it warm is often a clever idea. 50,000 BTU per hour heats up to 1250 sq. ft. Note : Many garage like this one include a Natural Gas to Liquid Propane conversion kit. Easy to Install and Maintain: Most small to mid-sized garage heaters are very easy to install, especially if they are electric models. With gas powered garage heaters, you might need to hire professional help in order to connect the heater with the gas lines and setup everything properly. However, that is still way easier and less time-consuming than having heating ducts installed in your garage, in order to connect it with a central heating system. Besides, garage heaters are extremely space-efficient and some units can even be mounted on the wall or ceiling to ensure optimal space distribution inside your garage. Garage heaters are self-contained systems that often heat the nearby space directly, hence they are easier to repair and maintain. Most of the time you can detect a malfunction and repair it yourself with some basic understanding of tools and how a garage heater works. Protects Expensive Tools/ Equipment: If you happen to have a small workshop setup inside your garage for working on home improvement projects or simply to pursue your hobby of choice such as metalwork, painting carpentry, etc., then it is very important to ensure that the tools and complicated machinery in your shop don’t get exposed to chilly temperatures for prolonged periods of time. Freezing temperatures tend to cause contraction of parts on a microscopic scale, and these parts will then expand during daytime. While most high-quality components are designed to tolerate such periodic compression and expansion, extremely low temperatures can cause some delicate parts to contract beyond their rated tolerance. If you own a table saw, electronic drill, pneumatic tools, or pretty much any other tool that uses electronic components, then it is important that you prevent condensation from forming on the surfaces, and especially the interiors of these machines. A garage heater will help by maintaining suitable temperatures at all times. Keeps Your Car Warm: Winter can be especially harsh in some parts of the country, and Canadian car owners are going to appreciate owning a garage heater more than anyone else since it will help in keeping the car ready to go at all times. No matter if it is raining snow outside, or if your car has been lying in the garage for more than a week- as long as you run the garage heater, it will warm up the air inside your garage almost immediately and make sure that your car starts up with one key turn. The heat will prevent your car engine from freezing up, and it also ensures that condensation doesn’t take place on any of the delicate electronic components within your vehicle. Provides a Comfortable Environment to Work In: No matter what you use your garage for, one thing is for certain- you can’t do anything if the inside is too cold. After all, not everyone likes to wear full winter clothing just so they can step into the garage. So, here is the easiest solution- invest a reasonably small amount of money towards a quality garage heater. This ensures that you feel comfortable and warm while doing whatever it is that you tend to do inside your garage. Repairing your ride? Working on a brand-new kitchen cabinet or door/ window panel? Or perhaps you have a little lounging area setup in the garage where you tend to come and relax whenever you feel like it. As long as you use your garage for anything more than parking the car, it is wise to invest in a garage heater to make it a much more inhabitable place, not just for your car and tools- but also for yourself. 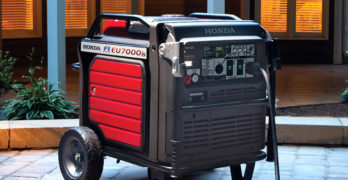 Can Also Be Used on Farmhouses and Construction Sites: Although it is called a garage heater because of the way it is designed and optimized for small, closed spaces like a garage, there are no rules against using a garage heater as a general-purpose heater in places other than the garage. With a little bit of creativity, you can find a whole lot of applications for this extremely versatile machine. They can be used to heat farmhouses since the large rooms, as well as irregularly sized windows and doors make it hard to install conventional heating systems in a typical farmhouse. Also, installing a garage heater in any room is a fairly easy task. If you happen to own a dedicated workshop in or around your house, you can purchase a garage heater for the shop and ensure that you don’t have to give up on your hobbies or projects whenever the weather takes a frosty turn. You don’t necessarily have to heat the entire workshop, instead use the swivel feature (kind of like the flaps on your AC or room cooler) to direct heat towards your seat and workbench/ worktable. Garage heaters are particularly effective in places that feature little to no insulation, since these things are self-contained, constant sources of heat. You can even use them outdoors, on construction sites for example. How Does a Garage Heater Work? Ever since early man discovered fire, we humans have constantly been innovating methods to keep ourselves warm during the cold. Today, we have a variety of heating solutions that can run on electricity, propane, wood, etc. Furnaces, ceramic bar heaters, oil-based room heaters, electronic central home heating systems, infrared heating solutions- there are plenty of ways to heat up a closed space. One of the major ways in which a garage or space heater differs from the central heating/ cooling system installed in most modern homes, is that the heat used to warm up the room is generated directly, i.e. the heat source is placed within the room that it is meant to keep warm. Your central heating system consists of one heat source which could be a furnace or electric heat generation mechanism that consists of heating coils. This source of heat warms up the room that it is located in, but is also connected to the rest of the house through a system of air ducts that allow the heated air to circulate throughout the rest of the home, and temperatures are kept steady via a thermostat. With a garage heater, you are only concerned with warming up a small area. This area doesn’t necessarily have to be well-insulated, since a garage heater is designed to heat up the immediate surroundings rather quickly, and provides a steady flow of heat. That is why a garage heater is so cost-efficient and effective in places like garages and basements- it consumes less energy than a central heating system to maintain similar temperatures, and does so even better if the space is not well insulated (since your heat source is located directly inside the room). Most garage heaters rely on the principle of convection or radiation in order to warm up your garage/ basement. Some convection-based garage heaters also include a fan that blows the warm air out the front, and draws chilly air in through the back. This is a technique called “forced convection”, and these heaters are called “forced convection heaters”. More on them in the next section, where we discuss how each type of garage heater works. No matter the design of a garage heater, its underlying principles never change- you are essentially trying to heat up an enclosed space with an artificial heat source. Heat flow is generated by varying temperatures, and heat transfer always happens from a body of higher temperature to another body of lower temperature. Heat is basically a form of energy, and its goal is to achieve a more stable state (a state of lower energy) than it is currently in. Just like electric current is generated by a difference in voltage potential (current flows from a higher voltage to a lower voltage), and flow of water (natural flow) occurs because of a difference in heights, heat will always flow from a hotter place to a relatively cooler place. And this flow will increase the temperature of the area to which heat is flowing, which in this particular case- results in a warmer garage. All the differences in between various garage heater designs arise from how the heat is transferred (convection, radiation, conduction), as well as the type of heat source (electric, propane, wood, etc.). In the next section, we shall discuss about how distinct types of heaters generate and distribute heat. A convection-based heating system uses “convection currents” to propagate heat energy across a certain volume of space. Convection-based heaters cannot do their job in vacuum, since some form of fluid or intermediate medium (in this case, air) is necessary to carry the heat from within the heater to the rest of the room. Convection heaters with a fan are often called “forced convection” heaters, since they depend on the airflow generated by the fan in order to propagate heat energy. Just like the turbocharger in a car boosts the power output of the engine, a forced convection garage heater delivers higher volumes of heated air across a larger space since natural air current is not nearly as powerful as the air flow generated by a fan. Inside a convection heater, you will find some sort of heating element. This heating element is what generates the heat, and then this heat is propagated across the room through convection. To give you an example of exactly how convection works, consider a kettle of water boiling on a stove. The heat which is RADIATED by the stove flame/ electric coil is considered as “radiative heat”, since it is propagated by photons of light and can travel across a vacuum. The bottom of the pot is heated by this radiative heat, and then this heat energy is transferred to the water that is in CONTACT with the bottom of the kettle through “conduction”. As the water towards the bottom begins to heat up, it expands and the air captured within this water is released in the form of bubbles towards the top. The water that is converted into steam is lighter than air and flows upwards, carrying heat along with it. The heat transfer occurring through steam can be considered as “convection”. Basically, when a fluid such as air or water is heated and flows away from the source in the form of a current, it is going to carry the thermal energy along with it on a molecular level. This process is called convection. Convective garage heaters provide a consistent source of heat, and can cover larger areas than radiative heaters. However, you will need to make sure that the garage or basement has decent insulation if you are using a convective heater. There is also a slight warm-up time, these heaters don’t provide warmth as soon as they are turned on. Heating elements in convective heaters often consist of electrical rods/ coils encased within ceramic blocks or placed next to oil-filled pipes that act as a filler. The filler stores heat generated by the electric coil/ rod, and this heat is then picked up by air for convective heat transfer. Thermal energy can also be propagated without the need for a fluid or intermediate medium. When electromagnetic waves are emitted from a surface, thermal energy is also generated. For example, consider that light bulb or fluorescent lamp in your room. Ever tried touching it in the morning after it has been on for a whole night? Yeah, it doesn’t feel very pleasant. Radiation can occur through vacuum, or any transparent medium (solid and fluid.) Thermal radiation is the direct result of random movement of atoms and molecules within matter. When charged protons and electrons are excited, they will move around resulting in emission of electromagnetic radiation. Radiative garage heaters use a heating element that emits infrared light, which is then bounced off from a series of carefully arranged metal/ glass mirrors. The infrared radiation is invisible, since its wavelength is beyond the visual spectrum that human eyes can see. However, our skin and clothes can absorb the infrared radiation, meaning that we feel warm even though the surrounding air is cold. Direct– These heaters are capable of sending the infrared radiation directly onto a surface or parts of the room which need heating. You can see a heating element at the center which emits infrared light, and there will be metal plates or mirrors around it to focus the radiation on a particular path. Indirect– In the second type of infrared heaters, heat is generated through radiation but is propagated through convection. For example- an infrared lamp generates the rays of light which are then inflicted upon a heat-exchanger (surface that is an excellent conductor of heat, such as copper). Then, a fan located behind the heat exchanger will pull cool air through the back of the heater and force it over the heated copper plates.The air that flows out through the front is warm, and heats up your garage. Infrared heaters are better suited for heating up specific parts of a room, since their beams can be focused onto a particular spot as opposed to convection heaters which heat up everything in the room. Remember that infrared beams will only heat the surface of matter, so for example- you have a toolbox lying on the floor, and point an infrared beam at it. When you touch the outer part, you will feel warm. But when you open the toolbox and pull out a tool, you will find that it is cold. This effect varies based on how powerful the infrared heater is, and whether it is direct or indirect type. Indirect meaning, the heat source is radiative, but the heat energy is distributed through convection (explained previously). Radiative heaters are great for keeping small garages or basements warm, or you can use them for spot-heating (two people working on a bench). The biggest strength of radiative heaters is that they can be used in poorly insulated rooms, since they don’t heat the air, rather the heat is transferred directly to your body and absorbed by the skin. The most common heating element in infrared heaters is a nichrome resistance wire stretched across the middle of a silica tube, which is open to the atmosphere at both ends. In some designs, the silica tube is sealed on either end, but with a different resistance alloy as the core instead of nichrome. Garage heaters can be powered by? Lower Upfront Costs: To purchase and install an electric heater, you have to spend less on the actual heater itself. Installation costs are also lower because you don’t have to worry about gas pipelines or venting. Fewer Limitations: While installing an electric heater is quick and almost effortless, the fact that you don’t have to worry about venting/ exhaust gases means that you can mount the heater virtually anywhere you want. Easy to Maintain: A malfunction in a gas-powered heater could result in emission of harmful fumes. A malfunction in an electric heater will be limited to the unit itself, rarely putting your family at risk. It also doesn’t have to be checked and cleaned as often as a gas-powered heater. Higher Running Costs: Only 30-35% of the electricity is converted into heat even though the heater itself may be close to 100% efficient. This is taking into account all the power loss which occurs as the current flows from the power plant through the grid, local power transformers, and finally into your home. Also, electricity costs more than natural gas in most parts of the country. Slower heating: Electric heaters need warmup time to generate heat, so you might need to wait a bit before the thermostat settings kick in. Less expensive: In most parts of the country, natural gas tends to be cheaper than electricity and the overall efficiency with gas heaters is also higher. Heats up Faster: Gas burns at maximum heat as soon as the burners get active, unlike electricity based heaters which need time to build up heat on the resistive coils. Higher Upfront Costs: Gas heaters cost more to purchase, and you often times need a professional to do the installation because of all the rules and regulations regarding venting. You need to connect your heater to the gas pipeline and route the exhaust properly, always check with your local building inspection committee before you take on any of these tasks. Shorter Lifetime: The typical lifespan of a gas-based heater is about half as long as that of a comparable electricity powered unit. More Maintenance Expenditure: Since gas powered heaters run on natural gas, they tend to emit pollutants and need to be cleaned on a yearly basis. Burnt residue needs to be removed, and skipping maintenance could put your family at risk of exposure to harmful carbon monoxide fumes. Before we talk about which type of garage heater is right for you and what features you need in a good heater, it is crucial that you understand the importance of selecting an optimally sized garage heater for your needs. Why is this so important? Well, obviously if the garage heater is too small it can’t heat your garage or workshop effectively. Too large, and you will often find yourself turning down the settings on the thermostat, thus not using the heaters full potential at any given time. Besides, larger heaters consume more power, and this brings us to the question of efficiency. How to size your garage heater so that you get the most savings out of your electricity or gas bill while also not compromising on heating power? You see, sizing your heater is more important than you initially thought. It is not just about performance, but also about obtaining the most efficient solution possible since you are going to be using this machine over the course of 5-10 years at least, and every cent that you save per hour will matter in the end. Wattage– This refers to the energy conversion rate of an electric heater, or the speed at which it can convert electric energy into heat. One watt is a unit of power that is equivalent to one joule of work per second. One general guideline while selecting an electric garage heater is to have 10 watts of heating power for each square foot of space. So, for example – if your garage floor measures 550 sq. feet in area, a crude estimate of heater wattage is 550 x 10 = 5500 watts. This is not very accurate however, and is certainly not the most efficient way to size up a heater for your needs. Wattage of a heater can be calculated by multiplying amperage (current) with voltage (electric potential/ pressure). For example, if a garage heater is rated for up to 45.8 watts at 120 volts, it means that the maximum wattage of this heater is- 45.8 x 120 = approximately 5500. BTU– While wattage is used to determine the heating prowess of electric models, BTU (British Thermal Unit) is the unit of measurement which denotes the power of a gas-based heater. One BTU is defined as “the amount of heat required to raise the temperature of one pound of water by 1°F”. BTU is a unit of energy, unlike watt which is a unit of power (work/ time). So, BTU/h would be a more accurate representation of how much heat a heater generates (per hour). Remember that- 3.41 BTU/h = 1 Watt. BTU is also considered as a measure of the amount of energy contained within a certain volume of flowing liquid. Hence, it is used to gauge the heating power of gas-powered heaters (since they are fueled by natural gas, which is a fluid). Temperature Rise– Let’s say the temperature outside your garage is 35°F. You want the interior of your garage to be at 65°F. Temperature rise is obtained by subtracting the exterior temperature from the temperature that you want your garage to be at. Which in this case would be: 65 – 35 = 30°F. How long will your heater take to increase the temperature within your garage by 30°F? Well, that depends on its wattage/ BTU rating, as well as the heater design (natural or forced convection, etc.). R-Value – This is a measure of the thermal resistance of a material, i.e. how well it restrains the flow of heat. The higher R-value a material has, the more effective it is as an insulator. R-value of the materials used in the construction and insulation of your garage will determine the amount of heat loss, as well as the size of heater required to maintain optimum temperature inside your garage. Volume refers to volume of the garage, temperature rise is exterior temperature subtracted from the desired temperature within your garage. Insulation value is a little more complicated, and can vary depending on how well insulated or poorly insulated your garage is. You can use 1 for average insulation, 0.5 for heavy insulation, 1.5 for below average insulation, 5 for extremely poor insulation, etc. Basically, take the R-value of materials used to construct your garage, and divide it with the average R-value for your particular state/ area. You can search up the average insulation values or R-values for different states and localities online. To convert the result from BTU/h to watts, simply divide by 3.41. Determining the appropriate size for your garage heater is extremely important, but not the only factor to be taken into consideration while making a purchase decision. Safety plays a key role, and you need to make sure that your garage heater passes certain standards in order to qualify as a good purchase. This is especially true with gas powered heaters, since a malfunction in one of those can put your entire family’s health at risk. UL– A UL certification implies that the garage heater has been deemed safe by the Underwriter Laboratories, as well as the Occupational Safety and Hazards Administration (OSHA). Compliance to UL safety standards is considered mandatory by the National Electric Code (NEC), which is the regional standard for safe installation of electrical devices in the USA. CUL– Refers to the safety standards set by the Canadian Electrical Code, issued by the Canadian Standards Association. Similar to UL, but not interchangeable. ETL– Products that carry the ETL badge are certified by the Edison Testing Laboratories, and conform to their safety standards. ETL is a nationally recognized laboratory, as well as a part of the OSHA. ETL provides independent verification that an electrical product conforms to the standards deemed safe for usage in American homes. Mounting bracket: Allows you to mount your heater on the wall or ceiling, thus saving precious floor space. This is especially good if you don’t plan on moving the heater once it is installed. Thermostat: Look for an adjustable thermostat on your garage heater. This will allow you to maintain the temperature of your choice while working in the garage or basement. Portability: Wheels and handles are always nice to have on a garage heater if you plan on using it for outdoor applications (on jobsites). Fan: A fan allows the heater to disperse warm air across a larger area, and it also helps in heating up a closed space more quickly. Besides, you can turn on the fan without activating the heater to enjoy a nice little breeze during summer season. Best Garage Heater for small spaces up to 700 sq.ft. 26.1 amps can heat a garage, basement or small warehouse. So a separate fan and motor control power source is not needed. Steel fins are copper brazed to low watt density, steel-sheathed tubular heating elements. Element is finished with aluminized paint for corrosion resistance. Heater when temperature returns to normal. Resistance. The color is neutral grey. Intermediate positions, as well as any positions in between. On hinges for full access to controls and wiring. Thermostat. Temperature range 45ºf to 135ºf. Heating element has cooled after the heating cycle. Overheating and reactivates it when operating temperatures return to normal. If you have a garage or workshop that is under 500-600 sq. feet in area, and you need industrial grade heating performance at consumer-level price tags, then check out the Fahrenheat FUH54. This is a sturdy 5000-watt forced convection electric heater, and can cover up to 600 sq. feet of enclosed floor space. Some customers even used this heater to warm up garage spaces as large as 700 square feet, and claimed that it was more than capable of maintaining temperatures in the mid-60s during winter nights. It also features a high-temperature cut out which automatically shuts down the unit once it reaches overheating point. This cut-off feature can come in really handy when the thermostat fails, or there is a sudden power surge in the system. The Fahrenheit FUH54 can be installed by a professional, or you can do the job yourself if you are familiar with heavy-duty electronic components such as these. It requires a 240-volt heavy duty power supply, and has an amperage of 26.1 meaning that you will need to install a 30-amp breaker in your home circuit. Most home circuits use 20-amp breakers, and this unit is too powerful for that. Since this heater is rated at 5000 watts, it pumps out 5000 x3.41 = 17050 BTUs of heat energy per hour. One of the things that we really love about this garage heater is the fact that it can be installed virtually anywhere you want. You can install it on the floor, attach it to the wall, or even hang it from the ceiling by using the included ceiling mount bracket. The Fahrenheit FUH34 supports both horizontal as well as vertical mounting, along with any position in between. There are adjustable metal louvers on the front, so you can conveniently control the heat output direction. The FUH34 can be used as a primary heat source in your garage/ workshop, or as an auxiliary heat source for larger areas such as storehouses, worksites, service stations, etc. To facilitate easy temperature control, Fahrenheit has included a built-in single pole thermostat which has a range of 45°F to 135°F. Although the FUH34 may not have a whole lot of fancy features, it’s designers did make sure to get the basics right. For example, the fan in this heater does not activate until the heating element reaches a minimum temperature point. This delayed fan action ensures that the heater doesn’t blow any freezing air at you, and only activates when the heating element is warm enough. But the intelligent design doesn’t end there – once the thermostat is satisfied, i.e. your desired temperature has been achieved, the heater will turn off in order to prevent itself from heating the air beyond said temperature point. However, the fan keeps running until the heating element cools down. This is to make sure that you enjoy a steady, consistent flow of warm air at all times. This also extends component life, since the heating element is cooled down gradually by the running fan, instead of losing temperature suddenly. In terms of safety, this heater checks all the right boxes- it is CSA, ETL, and UL listed. If you are short on space in your garage, don’t worry- the FUH34 measures just 14.5 x 11.25 x 12.5 inches, and weighs a mere 29 pounds. We say “mere”, because 29 pounds seems rather trivial if you take into account the heavy duty stainless steel body and rugged wall mount bracket. Can heat up to 600 sq.ft. For people who want precision heating in their garage or workshop, an infrared heater is the way to go. Unlike convection based garage heaters, an infrared heater will only heat certain parts of the garage. And, it does so without heating the air. You feel warm since the infrared radiation is absorbed by your skin, and you can easily use an infrared heater to provide spot-heating in small rooms, workshops, basements, etc. One of the most popular infrared garage heaters in the market, is the Dr. Infrared Heater model DR-988. This is actually a hybrid, meaning that the heating element generates infrared beams which are focused on heat exchangers. A fan is located behind the heat exchanger, and it blows the heat out through the front grill. Just like all good garage heaters, the DR. Infrared DR 988 comes with an automatic cut off system which instantly shuts down the core of the machine in the event of accidental overheating. But it also contains another safety feature which is somewhat rare, and only found in premium quality portable heater models- tip over protection. If the unit were to be accidentally tipped over, the built-in safety switch activates and cuts off power to the heating element immediately. This can protect your shop/ garage from a potential fire hazard or electrocution accident. Effective maximum heating range of the DR 988 is 600 square feet. Since this is a portable garage heater, it is designed to be lightweight and mobile. Despite the heavy duty stainless-steel exterior, total weight is a mere 20.5 pounds. The build quality is impeccable, and almost gives the impression that this heater is designed for industrial usage. What is even more interesting is the price- at nearly half the cost of most 5000 to 7500-watt convection based electric garage heaters, the DR 988 from Dr. Infrared is an absolute steal of a deal. It doesn’t have the coverage of a permanently installed convection heater, but it is certainly much safer and easier to use in small areas because of the infrared heat generation and extensive safety mechanisms. Talking of safety, there is a black steel safety grill on the front that is designed to keep your fingers safe, should you ever touch the front portion of this heater by accident while it is running. This front grill will also keep children and animals away from trouble, since you will most likely have the heater lying on the floor or on a desk. There is a carry handle on the top, and you can also permanently mount it onto a stand if you desire to use it as a primary heat source inside your workshop or garage. A totally enclosed fan motor ensures longer lifespan, and guarantees that your DR 988 will never malfunction when you use it outdoors on a jobsite. 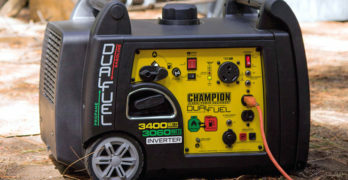 It is powered by a 240-volt supply, and draws 30 amps of current. Total wattage ranges between 4200 to 5600 (heat output ranges between 14322 to 19096 BTU/h), and air flow rate is 357 cubic feet per minute. Power is supplied through a heavy-duty 6’ cord with a NEMA #6-30P receptacle. In terms of convenience features, it packs an easy to operate electronic thermostat that has a range of 45-95 ° F. The air intake is finger proof, so are the discharge grills on the front. Measurements are as follows- Height:15.875″ Width: 11.5″ Depth:11.5″. The DR 988 features a 1-year warranty, and is ETL certified. Commercial Electric Heater heats quickly and efficiently. Hardwired; Power cord not included in the unit. Dimensions: Overall Height – Top to Bottom: -14.5″. Overall Width – Side to Side: -13″. Overall Depth – Front to Back: -14.5″. Are you planning to buy a super-silent garage heater for your workshop? In that case, you might want to check out the Dr. Heater DR966. Not only is it extremely well-built and compact, but is also renowned for being one of the quietest portable electric garage heaters on the market. Even though the manufacturer labels this 600-watt hardwired garage heater as “commercial-grade”, its price is anywhere between 40-50% less than most similarly sized consumer garage heater models. Don’t mistake its affordability as a sign of poor construction quality- it features a rugged stamped steel front grill, with 5-way adjustable louvers for complete airflow control. The DR 966 utilizes a spiral steel metal sheath electric heating element, this is one of the best electric heating element designs currently available for the consumer market. The low sheath temperature significantly improves lifespan, while also providing inform heat for maximum consistency across all temperature settings. You can use this garage heater as a primary or auxiliary heat source, and it is also an excellent choice for places such as dormitories, hospitals, churches, and pretty much any worksite which demands low noise heating performance. If you are wondering how silent this heater is, it pretty much functions at the noise level of a face-to-face conversation inside a room. You will barely even notice that it is running, while you are busy working in your garage or workshop. The primary reason behind this super-silent performance is the large 8” fan which is mounted on advanced self-lubricated ball bearings, resulting in high airflow at low rpms, and with minimal vibration. Less vibration, less noise. The large fan generates tons of airflow, resulting in an effective heating range of about 600 sq. feet. The DR 966 packs 6000 watts of heating power, which equates to 20460 BTU/h. Safety features include- automatic shutoff to prevent overheating, finger-proof intake and front grill, and a Tip-Over safety switch. Despite its all-metal construction, this garage heater weighs just 30 pounds. It can be used as a portable heater, or you can mount it to the wall or ceiling with the help of the included mounting brackets. There is a carry handle on the top, along with a built-in thermostat that has two preset modes- “Low” and “High”. You can also control temperature manually, using the dial on the front panel. Although this is a hardwired heater model, it doesn’t come with any power cord. The DR 966 requires a 240-volt supply, and is certified by the UL as well as CUL. Can be used as either your primary or auxiliary heat source. The Dr. Infrared Heater DR 988 is an extremely great heater, it is portable as well as powerful. With tons of safety features and a compact, lightweight design that is easy to transport from one jobsite to another. But how do you make a product like the DR 988 even better? Well, how about installing a remote-controlled thermostat in it? All you have to do is press a couple buttons on the remote, and you can switch the temperature settings on the thermostat of the DR 975. This feature is especially handy if you are planning to use the DR 975 inside a workshop, since you don’t have to leave your work just because you want to change the thermostat settings. Unlike the DR 988 which was designed to be a portable model, its more expensive cousin, the DR 975 is a stationary hardwired garage heater that comes with mounting brackets for the wall and ceiling. It is a 240-volt, single phase 4700/ 7500-watt hybrid infrared heater. What we mean by “hybrid”, is that the heat is generated from a radiative source, but is propagated by means of forced convection, using a fan that blows the air through a heat exchanger. This mechanism is similar to that of the DR 988, except the DR 975 is equipped with a more powerful heating element that is rated at a maximum capacity of 7500 watts instead of 5600 watts like the DR 988. Converting the heating power from watts to BTU/h, we can see that the DR 975 is capable of generating anywhere between 16027 to 25575 BTUs of heat energy per hour. And all of this heat is sourced from a very specially designed electric heating element that is designed to not only heat up faster, but also last longer while providing a consistent and even distribution of heat. Just like the DR 988, the DR 975 uses a spiral sheath metal electric heating system that runs at low sheath temperatures, resulting in superior lifespan and rapid heating. You spend less time waiting for the heater to warm up, and this is especially important after you return home on a snowy day. You just flip the switch on the remote, and the heater warms up within seconds. Since this is an infrared based heater, the heat can easily be focused on a particular area instead of letting it dissipate all over the place. There are 4 adjustable louvers on the finger-proof front grill to adjust airflow, while the front panel contains a dial which lets you manually adjust thermostat settings. Thermostat temperature range on the DR 975 is between 50-90 degrees Fahrenheit, and the entire unit is built like a tank to stay protected from external shocks. There is a grey epoxy paint on the exterior that protects the stamped metal body from rusting, and the motor is fully enclosed to prevent damage from dust and foreign particles. The fan is mounted on heavy duty, permanently lubricated ball bearings for minimal turbulence and noise. There is a nice little digital temperature display on the bottom that comes in handy while setting the thermostat through remote control. Best garage heater if you need a mobile option. Portable heavy-duty heater. Very well-made. What do you get when you take a 10,000W infrared heating element, throw in a fully enclosed heavy-duty ball bearing motor + fan assembly, then wrap it all up inside a durable stamped steel case? You get the DR 910M garage heater. Designed to take on commercial tasks such as workshop and storehouse heating, this portable electric heater is a perfect addition to your arsenal if you’re planning to warm up an area of 600-1000 square feet. Multiple DR 910Ms can be used as auxiliary heat sources in dormitories, service stations, hospitals, etc. because of how compact and portable these units are. Despite being so powerful, each DR 910M weighs just 48 pounds and is mounted upon a cart body for easy maneuverability. There is also a wall/ ceiling mounted version of the DR 910, called the DR 910F. We shall discuss more about that model in the next review, but for now let’s focus on why the DR 910M is so unique, and how you can benefit from purchasing one of these. Firstly, each DR 910M can pump out up to 34,100 BTUs of heat energy per hour. That is enough to take on a 1000 square foot workshop or garage, and since these heaters are so portable, you can actually take one of them onto your jobsite to keep yourself and your crew warm during a chilly day. Heavy duty fully enclosed motor. The DR 910M is designed from the ground-up to be portable, and silent running. Its large fan is mounted onto heavy duty self-lubricated ball bearings, while the motor is completely sealed off to prevent dust and debris from flying inside. The exterior shell has been made as compact as possible, resulting in physical dimensions of just 21 x 24 x 33 inches. Keep in mind that this is a 10,000-watt, 240V electric garage heater which requires hardwiring to function. Most heaters in this class are either wall or ceiling mounted. They are also much larger and heavier, as well as harder to operate. This heater comes with a built-in thermostat that can be controlled via remote, and has a temperature range of 50° F to 90° F. If you don’t plan on moving your garage heater very much, or if you simply want a machine that can quickly warm up your workshop without taking up any floor space, then we recommend that you take a look at the next heater model on this list, the DR 910F. The suffix “M” stands for mobile, while “F” stands for fixed. If you are short on floor space and don’t plan on moving the heater around very much, then the DR 910F will be a much better purchase. However, if you want fast and reliable heating on jobsites as well as a super silent and lightweight model that can be moved around by hand, then the DR 910M is probably one of the best choices for you on the market right now. There are 5 adjustable louvers on the front grill, and controls are extremely easy to operate. The DR 910M is both UL as well as CUL certified. Comes with a 1-year warranty on parts and labor. One of the best garage heaters for wall or ceiling mounting. Hardwired, wall/ceiling-mounted heater can be placed anywhere. Okay, since you have read about the DR 910M, you know what to expect from this model in terms of performance. The DR 910F and DR 910M both share the exact same guts, with the only major difference between the two models being the external shell. Instead of being mounted on a cart body, the DR-910F is built with a mounting bracket on the top that can be attached to the ceiling or wall of your garage/ workshop. Just like the DR 910M, this is also a 10,000-watt hard wired electric heater that is designed for heavy duty workloads. 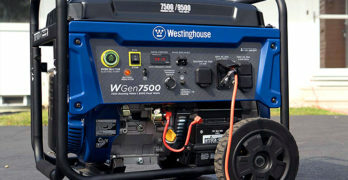 It will effortlessly handle worksites as large as 1000 square feet, and needs a 240-Volt single phase supply to work. Make sure that you have a 40-amp breaker installed before using one of these monstrous garage heaters. It is about as powerful as a consumer garage heater model can get, at least on the electric side of things. Install one of these on the wall or ceiling, and you will never have to worry about working in the cold for at least the next 10 years. That’s right, the DR 910F is extremely reliable and has a minimum lifespan of one decade. The reason behind this incredibly long lifespan is the build quality- all metal construction with heavy duty electrical wiring and commercial grade motor + fan combo. The heating element is similar to all the other Dr. Heater infrared models we have reviewed until now- spiral steel metal sheath electric heating element with low sheath temperatures for added lifespan and consistent heating performance. If reliability and performance are all that you care about, then few heaters can beat the DR 910F. It features a built-in thermostat which can be controlled via remote, and has a temperature range of 50° F to 90° F (same as the DR 910M). In terms of safety, the DR 910F is equipped with automatic overheating detection and has finger-proof grills on both the air intake as well as exhaust. There is also a timer features which lets you set a certain amount of time for which the heater will run before automatically shutting down. We all tend to be a little forgetful at times, and machines like these aren’t exactly light on power consumption. Which is why a timer can be extremely useful to have. There are 5 controllable louvers to adjust airflow direction, along with a tip-over safety switch. UL and CUL safety standards are met, and there is a 1-year warranty. Best garage heater for smaller spaces. Electric hardwired heater. Tough stainless steel construction. Versatile heater. Despite looking like an oversized grey suitcase, the NewAir G73 is one of the most respected electric garage heater models on the market. It is probably the sturdiest garage heater that we have ever come across, at least as far as electric models are concerned. The shell which looks like a large rectangular box, is built from sheets of stainless steel that provide extreme physical durability while also keeping the overall weight low enough, so that installation is a relatively easy task. Since this is a hardwired model, you won’t have to deal with some of the maintenance chores that are commonly associated with propane heaters. It will last for at least 10 years thanks to the completely sealed-off motor and advanced heating element, but the really amazing part is how little time you spend maintaining this heater throughout its minimum lifespan of 1 decade. Yes, running costs are higher when compared to a propane or LPG garage heater. But the money that you save in maintenance costs and installation expenditure, is going to make the trade-off in terms of running costs more than worth it, if you only use the garage occasionally. Or perhaps you plan on putting this heater in a workshop, and will only use it whenever you are working on a project. Whatever the scenario may be, 5000 watts of heating power is plenty for most people. It is sufficient to heat up a 500 square-foot garage featuring little to no insulation, and the forced convection means that heat propagates faster, resulting in minimal downtime between you turning on the switch and the heater actually heating up the place. When you convert the heating power from watts to BTU/h, you get a rating of 17050 BTU/h. The G73 comes with a bracket that allows you to conveniently mount the unit onto your garage/ workshop wall or ceiling. By mounting the heater on your wall or ceiling, you are freeing up what little floor space you have in your small to mid-sized garage. That floor space can be used to store extra tools, fit in a workbench, or you could use it as storage space for oil, paint, plants, etc. Just be careful to not store oil and other inflammable materials beneath or close to the heater. Fumes from oil and paint can get into the heater while it is running, resulting in sparks and a possible fire scenario. But as long as you don’t store inflammable stuff next to a 240-volt hardwired electric heater, you should be totally safe. After all, the NewAir G73 comes with automatic overheating detection and will shut down itself as soon as critical temperature is exceeded. It also includes an easy to control single-pole style thermostat, and adjustable louvers on the front to control airflow. There are finger-proof grills on both the air intake as well as exhaust. It draws 20.8 amps of current from the wall at 240 volts, we recommend that you install a 30-amp breaker to be safe. There is a carrying handle on the top, which is really useful since this heater is actually pretty compact considering how powerful it is. It weighs just 15 pounds, and measures 9 x 9.5 x 14 inches. Spark ignition and robust factory standard self diagnostic control module. 80,000 BTU per hour heats up to 2,000 sq. ft.
Mr. Heater is one of the oldest and most reliable names when it comes to heating solutions. Their Big Maxx series of garage heaters is designed with only one purpose in mind- delivering the absolute best garage heater that money can buy. The Big Maxx model F260560 is large, heavy, and costs more than twice as much as some of the 5000W electric models. However, why should you care about all that stuff when it pumps out 80,000 BTUs of heat per hour? After all, performance is what you are paying for right? And performance you shall get, thanks to the aluminum tubular heat exchanger that ensures maximum efficiency along with longer life times. In case we didn’t mention it before, this garage heater runs on natural gas. It is an excellent choice for workshops, garages, service stations, barns, etc. Installing this heater is slightly tougher than installing an electric model, but is still much easier than installing a conventional gas-powered heater. To make things easy for you, Mr. Heater has included a power exhaust that allows for both vertical as well as horizontal venting, giving you more options when it comes to selecting the right place for installing this 90-pound rectangular metal box (25.5 x 18.875 x 17.125 inches). There is exterior access to AC terminals and thermostat controls, along with support for ceiling installation via 2 angular brackets which are included in the package. The low-profile design of this heater ensures that you can mount it just 1” away from the ceiling, resulting in a higher clearance between the garage floor and heater. You have the freedom to use both right as well as left-side piping for gas, the same goes for electrical and flue connections. Some of the really interesting features include spark ignition with a self-diagnostic control module, and finger-proof intake as well as exhaust grills. Gas is supplied through a ¾” MPT pipe, and you have the option to run this heater with LPG instead of propane. All you have to do is use the natural gas to LPG conversion kit if you want to run the heater off a LPG cylinder. This conversion kit is provided for free with the F260560 Big Maxx MHU80NG. No thermostat is included, so you will have to purchase an external thermostat in order to maintain steady temperatures inside your garage. The F260560 Big Maxx MHU80NG requires a 115-volt power supply to run the ignition system, total current draw is 6 amps. There is a 3-year warranty on this heater, and running costs are significantly lower than that of an equivalent electric heater (natural gas is cheaper than electricity). This heater is ideal for both consumer as well as commercial usage, and can effortlessly heat a 3-4 car garage. Best garage heater, or for warehouses, large workshops, etc. 45,000 BTU with 80-Percent Efficiency. Featuring a tubular power vented propeller and 45000 BTU/h input capacity, the Modine HD45AS0111 is a beastly natural gas-powered garage heater that is designed to heat 2 to 2.5 car garages. The efficiency of this unit is about 80%, meaning that for each BTU of propane that you feed it, you will get 0.8 BTU of heat. The remaining 0.2 BTU is what we call exhaust, or waste. Taking efficiency into account, the Modine HD45AS0111 pumps out 36,000 BTUs of heat per hour. Which translates into roughly 10557 watts, and when we apply our crude approximation technique to determine how much floor space this much heating power can cover, it turns out to be 10557/10 = 1055 square feet (approximate). Okay, enough math – why is the Modine HD45AS0111 so popular, and what makes it unique? Well, this is one of the few low-profile natural gas heaters along with the Mr. Heater F260560 Big Maxx MHU80NG. A low-profile design lets you to install the heater to your garage ceiling or wall while maintaining extremely low clearance between the wall and heater (so you can install the heater in extremely tight spaces). While the Modine Hot Dawg range of garage heaters contains several models ranging from as low as 30,000 BTU/h to as high as 125,000 BTU/h, it is only in the 30,000-75,000 BTU range of models that you will find options for both left and right-side installation of gas lines and electrical cords. All you have to do is flip the Hot Dawg 45AS0111 around (180° tilt), and you can switch from left handed controls to right handed controls and ports. This applies to electrical and flue connections as well. The models in the 30,000 BTU to 75,000 BTU range feature 3” vents, along with aluminized heat exchangers for extended lifetimes and superior efficiency. This particular model, the Hot Dawg 45AS0111, measures 26.8″ x 22″ x 12.2″ and weighs 78 pounds. You can purchase a separately available LP conversion kit if you wish to run the heater off liquefied petroleum cylinders. Every Hot Dawg garage heater is supplied with a factory-installed venting system that allows for both vertical (through the roof) as well as horizontal venting (through a side wall). This ensures ease of installation, and combined with the low-profile design, it allows you to install the HD45AS0111 in places where conventional gas-powered heaters will never fit. Angled hanging brackets are provided alongside the heater, these allow for a snug 1” clearance from the ceiling. Louvers are fully adjustable to direct heat flow wherever it is needed, and there is a residential warranty of 2 years on all parts except the heat exchanger. The heat exchanger is covered by a separate 10-year warranty on parts and labor. This heater is made in the USA and CSA-certified. It uses a ½” gas connection, and requires a 115V AC power supply to run the ignition system. During clear conditions, the HD45AS0111 is capable of throwing warm air up to 27 feet away on maximum fan speed. You will need to buy a thermostat separately, since this particular model doesn’t include a built-in thermostat. Which Garage Heater is Right for You?